Welcome to our web site, please look around. Please let us know if there's anything you can't find or would like to see. Our community hall is officially open for business! Please check out our Community Hall page for information. The next scheduled meeting of the Parish Council is on the 20 Mayl 2019 at the Community Hall, Pear Tree Field, Stapeley. This will be the Annual Parish Meeting and Annual Meeting of the Parish Council. Members of the public are encouraged to attend this meeting to express their views during the Public Question Time slot. Details on the Standing Committees of the Parish Council and their membership is available here. Contact details for the members of the Stapeley Parish Action Group (SPAG) can be found on the Neighbourhood Plan page. Agendas for the Parish Council Committees can be found here and also from the Parish Council menu tab. for details of your councillors. We cannot please everyone all the time. What we can promise is to listen and to do what we can to deal with your problem. Details of the Complaints Procedure can be found here. 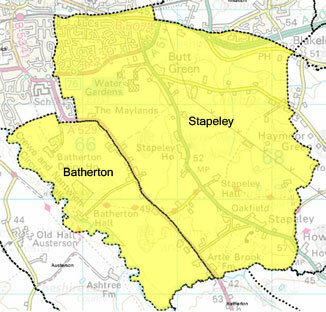 There is a vacancy in the office of Parish Councillor for Stapeley. If you are interested in contributing at ‘grass roots’ local government level and would like to put yourself forward as a candidate, please contact the Clerk (Click here for more details). Each year the smaller authority’s Annual Governance and Accountability Return (AGAR) needs to be reviewed by an external auditor appointed by Smaller Authorities’ Audit Appointments Ltd. Put Sunday, 24 June 2018 in your diary now! The Parish Council is organising an event at the community hall on this date. It is to link in with the national event ‘The Great Get Together’ in honour of the late Jo Cox. You can read and download a copy of the current Newsletter here. Stapeley Parish Action Group (SPAG) have produced a handy guide to some of the walks available to you in the Parish. It can be viewed/downloaded here. The Annual report for 2015-2016 can be found here. Previous years reports are available here. The minutes for the last meeting (5/1/16) can be found here. More information and a link to the site can be found here. Over 500 of our community responded to recent consultation, which ran until the end March 2015, sharing their views about the future of our parish. Thank you to everyone who participated. Details on the 2nd Public Consultation can be found here. The minutes for the last meeting (25/6/15) can be found here. The minutes for the last two meetings (3/6/15 & 11/6/15) can be found here. The Police have asked us to remind residents about a few important safety issues.